Did you know that you can configure Facebook to not show posts other users make on your Facebook page until you approve them? This is a common need among many businesses, especially among the vacation rental managers we work with at LiveRez. The process is fairly easy, if you know what to do. You just have to adjust your settings. Here’s how you do it. Go to your Facebook page. Click on the "Settings" button at the top right (by Help). Under Settings (in the General Tab - left-hand pane), click on "Visitors Posts." Then click on the radio button "Allow visitors to the Page to publish posts." Underneath it, click on the checkbox "Review posts by other people before they are published to the page." Finally, click on the "Save Changes" button. 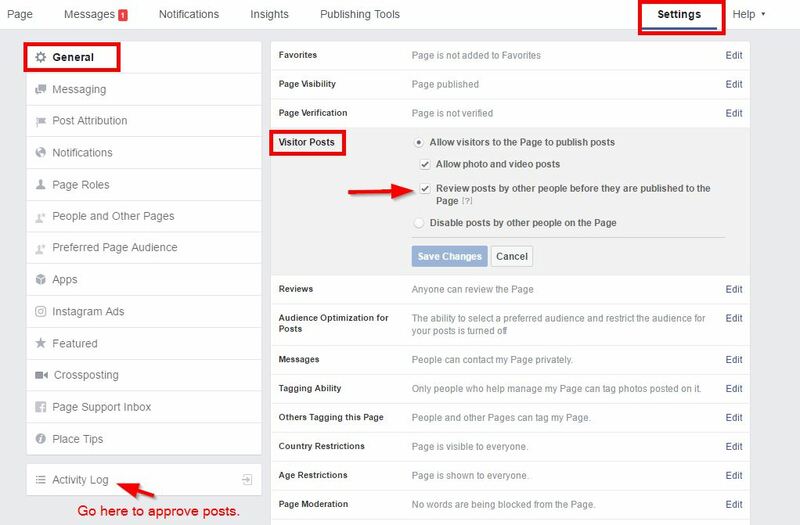 Now that you've got your setting updated, you'll be able to moderate posts to your page. You'll get a notification when someone attempts to post to your page. By default, it will be hidden from your page. To make it public, go to the Activity Log (it's in Settings too - left-hand pane at the very bottom). Then find the post in question. At the very right there's a pencil icon you can click on to make it public or private. There you have it. Now you're in control of post others make to your page.